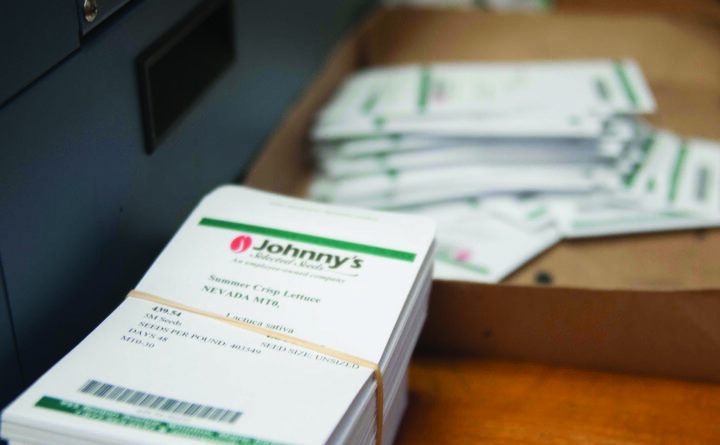 Freshly printed seed packets at Johnny's Selected Seeds. Just like fashion designers await the hottest trends for spring, this is the time of year gardeners and farmers eagerly peruse the famous Johnny’s Selected Seeds catalog, looking for novel items like purple carrots and the latest microgreens. And just like last year’s fashion gives way to the new, Johnny’s added 150 items in 2019, mostly seeds, as it does sell garden tools, manures and other products. The company still is in its most active business season, which started at the beginning of the year. Just a couple weeks ago, workers were spending 11 hours a day, three days in a row, filling orders for a special offer of free shipping on orders topping $50. “Our growth is concentrated in January, February and March, when people buy seeds in bulk,” said Gretchen Kruysman, co-CEO of the company, which has administrative offices in Fairfield and research, packaging and warehouse operations in Albion. “Our primary customer is the small farmer who sells at a farmers market or brings their products to a community supported agriculture location,” she said, although the ranks of home gardeners are growing quickly. Every year the company has introduced new products, a handful of which it develops itself and the rest from other companies or growers. “The breeding process takes about 10 years, similar to a new drug,” Kruysman said. That means only two to four new seed varieties will be ready for sale each year. Johnny’s breeding team develops new seed varieties that could potentially grow into tastier tomatoes or purple or red carrots. 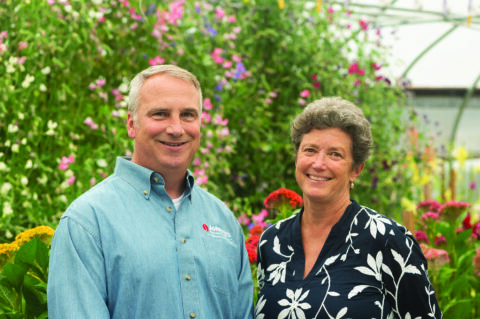 David Mehlhorn and Gretchen Kruysman, co-CEOs of Johnny's Selected Seeds, in the company's flower hoophouse in Albion. Founded in 1973, the company is owned by its employees, who continue to grow in number as farms diversify their products and new home gardeners join the ranks of people thumbing through Johnny’s 244-page catalog. More than 1.5 million catalogs were mailed out for the 2019 growing season. The catalog information also is online. The catalog includes the seeds and tools for sale and tips on planting and growing. Johnny’s had 210 full-time and seasonal employees in 2016, a number that has grown to 277, of which 185 are full time. Seasonal workers are brought in for the big seed-selling months early in the year. Afterward they can work at the research farm in the fields in Albion, where Johnny’s tests all of the seed varieties it sells. Annual sales of $40 million in 2016 have grown steadily to more than $50 million, Kruysman said. Seeds, including seedlings and potatoes, account for 80 percent of sales, while tools and supplies contribute the other 20 percent. Kruysman, who previously served as head of marketing, was promoted to co-CEO last July after the former CEO left. The company also promoted David Mehlhorn, the chief operating officer, to co-CEO. Kruysman handles the information technology, breeding R&D and marketing aspects of the company. Mehlhorn focuses on operations, finance, human resources and the call center. The 2019 sales season is off to a strong start following the close to 1.6 million seed packets sold in 2018. Johnny’s sells its products in the United States, Canada and overseas. The flower bulb trial field at Johnny's Selected Seeds in Albion. Farmers are adding flowers for color and variety to their farmers market stalls and community supported agriculture locations. Johnny's is selling new types of flower seeds like the Darwin hybrid tulip and the pink trumpet daffodil. Different colors and sizes of traditional vegetables, microgreens to use as garnishes or in salads and flowers for farmers markets are hot trends in the seed business, Kruysman said. “We have direct contact with customers, so we can ask how growing went last season and what they will explore this year,” she said. That’s via the call center, which both takes orders and answers customers’ questions. It’s also a good conduit to get feedback from customers. Part of the value added to the call center is farmers like Meg Mitchell, who runs South Paw Farm in Freedom with her husband. Mitchell, who also buys seeds from Johnny’s. She is working full time January through March and then plans to cut back her hours in April and May and go back to her own farm in June. South Paw is a 16-acre organic vegetable farm named after Mitchell’s and her husband’s mothers, who both are left-handed. It is located between Waterville and Belfast. Mitchell said it is rewarding to talk to other farmers and home gardeners about how to prepare the ground for kale and other plants. Johnny’s has its own compilation of advice, to which Mitchell adds some of her own firsthand knowledge. And she’s learned a lot about flowers from talking to customers who call. She may grow more on her farm this year. She sells her goods at the Portland farmers market and at several restaurants and grocery stores. She has also found that a lot more customers than expected are growing seeds totally indoors either in hoophouses or in their basements, including both farmers and home gardeners. That extends the growing season in Maine and helps in areas of the country prone to drought or flooding. One example is customer Olivia’s Garden in New Gloucester, which is about half an hour north of Portland. Kristine Dyer, Johnny’s territory sales representative for Canada and Maine, said weather volatility and labor shortages are among the biggest concerns for Maine growers with whom she works. Very hot and dry temperatures proved to be difficult for growers last season, she said, and she expects the same this year. Higher temperatures are bringing new plant diseases and pests to Maine farms that previously were unable to survive this far north. To manage weather extremes, Johnny’s recently installed four Rimol Nor’easter tunnels to support the testing and selection of varieties well suited to indoor growing methods. 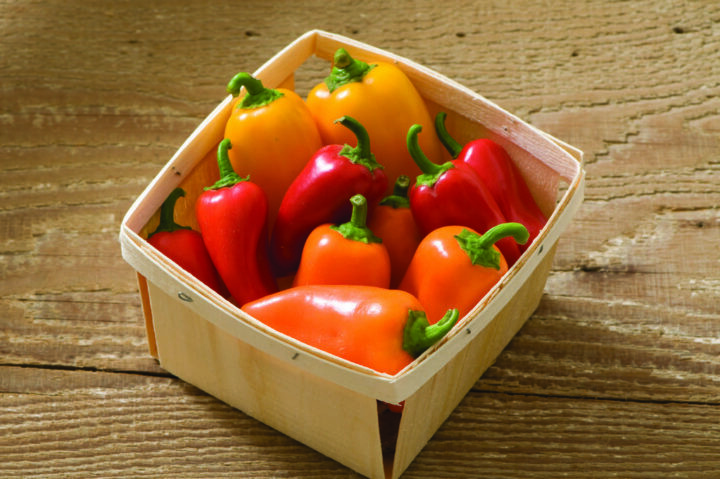 With consumers looking for healthy varieties of food and snacks, Johnny's Selected Seeds is offering more color and size variations in vegetables, such as these smaller, sweeter lunchbox peppers. Another trend paralleling consumer demand for healthy foods and snacks is smaller, single-serving sized and different colored vegetables. One example is Johnny’s lunchbox pepper mix of red, orange and yellow peppers that are smaller and sweeter than traditional peppers and good for snacks, Kruysman said. Different colors are being added to the carrot seed line, such as red and purple carrots. And heirloom vegetables, especially tomatoes, are coming back as consumers look for authentic foods to eat at home and in restaurants. Beets also are a popular item with consumers and restaurants that want to make food more appetizing with diverse colors. Beets are being used in some veggie burgers to make them juicy. Another colorful trend that Kruysman said is a big change is that more farmers are growing flowers to be sold as cut flowers. 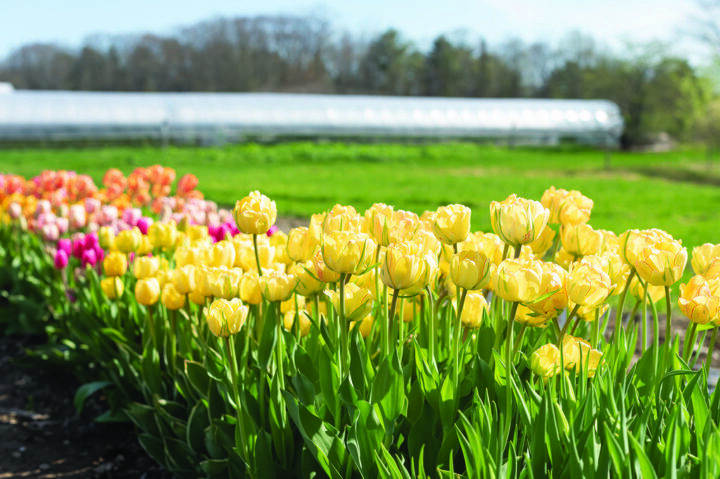 The demand for flowers prompted Johnny’s to once again offer flow bulbs this year, mostly tulips and daffodils in unusual colors and patterns such as Darwin hybrid tulips and pink trumpet daffodils.